This 9-day tour's itinerary covers the most popular sites in the major cities of Japan and South Korea, Tokyo and Seoul. This package will take you to all the hidden treasures around the two countries and will give you a deep insight into their culture and rich history, including accommodations and some meals. Upon arrival at Narita International Airport, meet your representative with name board. Board an airport limousine bus and be transferred to your hotel. After check-in, the rest of day is at your leisure. Today you will start your Tokyo grand experience with a pickup from your hotel and get a taste for all the amazing sights in metropolitan Tokyo. This morning visit Tokyo Tower, Meiji Jingu Shrine, Akasaka Palace (known as the Government State Guest House), and the National Diet Building. Afterward, enjoy a pleasant walk in the East Garden of the Imperial Palace. After driving through Ginza Shopping District, have a Japanese style lunch. In the afternoon your guide takes you to Hamarikyu Garden. After, board a Sumida River cruise to Asakusa Kannon Temple, also known as 'Senso-ji Temple', where you’ll have the chance to explore Tokyo’s oldest and most important Buddhist temple. After the tour, take a drive through Kappabashi, Ueno and Akihabara before being transferred back to your hotel for the evening. Have these two free days at your leisure to relax and pursue your own activities. Today have some time until meeting your representative at hotel lobby and transferred to Narita International Airport by airport limousine bus on your own for your flight to South Korea. Upon arrival at Incheon International Airport, meet your representative with name board. Board an airport limousine bus and be transferred to your hotel. After check in, the rest of day is free at your leisure. Meet your guide in the morning for your Seoul highlights tour. Visit the Gwanghwamun Gate and enjoy The Royal Guard Changing Ceremony. Next, explore Gyeongbokgung Palace (Changdeokgung Palace on Tuesday), and also visit National Folk Museum of Korea. Then pass by the Blue House, also called Cheong Wa Dae, the presidential residence. 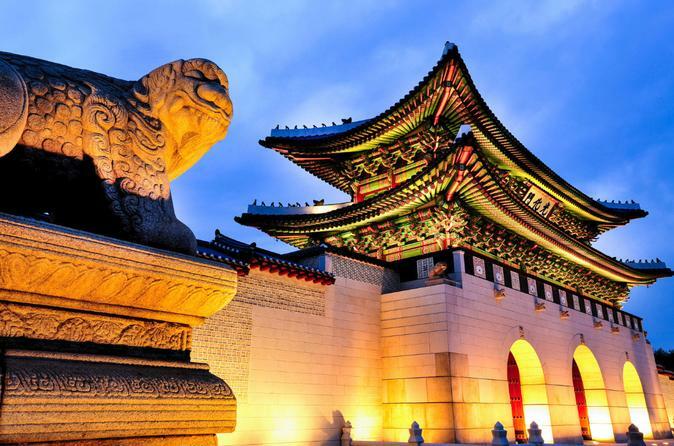 Then you will visit Insadong-gil, which is connected to a multitude of alleys that lead deeper into the district, with modern galleries and tea shops and also visit Jogyesa Temple, the chief temple of the Jogye Order of Korean Buddhism. After lunch at a local restaurant, explore Namsangol Hanok Village (Bukchon Hanok Village or Insadong on Monday) where there are five restored traditional Korean houses, a pavilion, a pond, and a time capsule. Next, visit N Seoul Tower, offering panoramic views of Seoul and the surrounding areas. After the tour, transfer back to your hotel. Have these free days at your leisure to relax and pursue your own activities in Seoul. After check-out, have some time until your transfer to Incheon International Airport by airport limousine bus for your flight to your next destination.